In your OneSport Console, select Administration from the top menu, then Question Listing, click Actions and Add. Mandatory: Select this if the question must be answer by every member. Ticking this option sets the default when the Question is added to a Form. This setting can be altered for each Form on the Questions tab of the Form edit screen. Mandatory Admin: This refers to if a member is added from the console. If the question is mandatory selecting this option sets the default when the Question is added to a Form. This setting can be altered for each Form on the Questions tab of the Form edit screen. New Row: Select this option if you would like the question listed below the previous questions in the form. If left unticked, the question will appear next to the previous question. Input Below Label: This displays the input box below the question. If left unticked, the input box will display next to the question. Input Width: This is the length of the input box and determines how many characters can be entered. 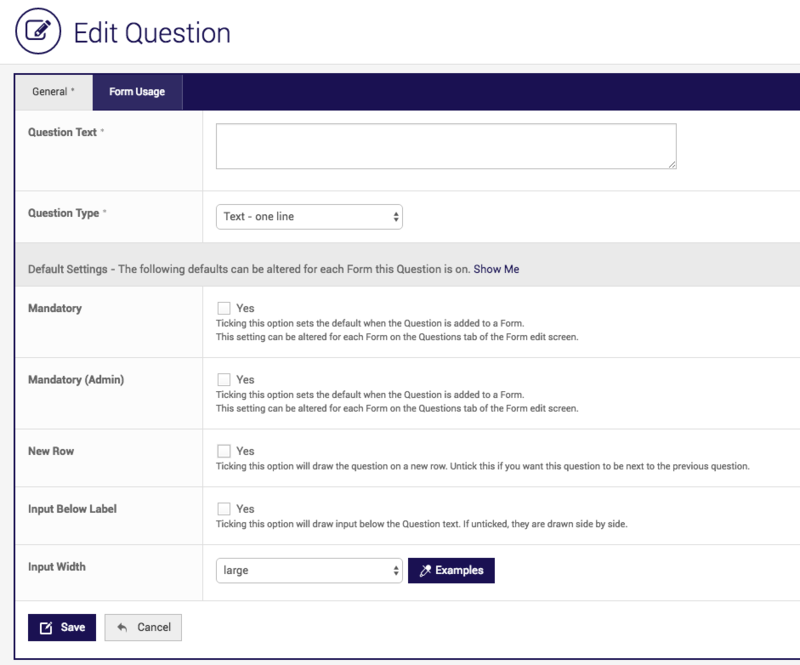 Once you have created a question you can now attach it to a Form.